With the daylight hours getting longer, and weather getting warmer, we are all thinking about getting outside, having a bbq or just enjoying sitting on our patios, sipping a glass of wine and chatting with family or friends. But what to drink? I received two bottles of wine from BC’s Spierhead Winery recently that would fit the bill; a Pinot Gris, and a Pinot Noir Rose. Both wines are from the 2013 harvest, which was the result of a beautiful, sunny, warm summer, so we should expect ripe fruit flavours, ranging from stone fruit to tropical fruit for the white wines. I tried their 2012 last year and noted how much I enjoyed it, with it’s range of flavours from citrus to tropical fruit to apples. It won a Gold Medal at Okanagan Wine Festival – 2013 B.C. Wine Awards and other awards as well. Their 2013 was pale to medium lemon with a tint of green in the glass. On the nose I picked up Granny Smith and Red Delicious apples, together with melons and a hint of vanilla. With some airing, lemon and grapefuit aromas also became apparent. It’s dry with medium plus acidity, with an acidic prickle that dances on your tongue. Medium plus body, round mouth feel, some creamy lees, a hint of honey, and stone fruits, pears, lemons and Red Delicious apple flavours. Again with a bit of air, I also picked up lychee. Quite a mouthful of flavours. Mouth watering finish. This wine really tastes like fresh fruit to me. A very nice example of BC Pinot Gris. With halibut season underway, I would love to try this wine with a griled halibut steak, nugget potatoes, and salad. 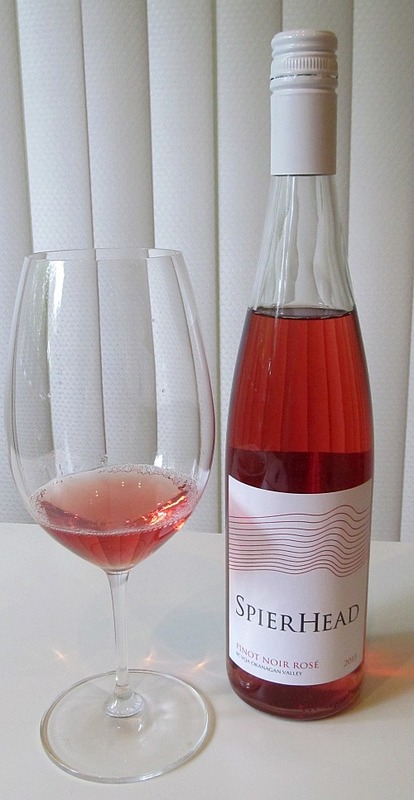 This is my first time to try the Spierhead Pinot Noir Rose, but I read that this is their second vintage. The grapes spend 48 hours on the skins to give the rose it’s pretty, light crushed raspberry colour in the glass. It greets you with youthrful red fruit and strawberry aromas, together with a hint of red cherries. It is dry, with medium body and acidity, and a south mouth feel. The red fruits and strawberries continue on the palate together with some sour red cherries, and a very light hint of spice on the tongue. It finishes witha bit of bitter leaf on the finish and with mouth watering acidity. Everything is very light and balanced in this wine. It is an easy to drink, straight forward rose. Pair with a platter of charcuterie and some brie on the patio. 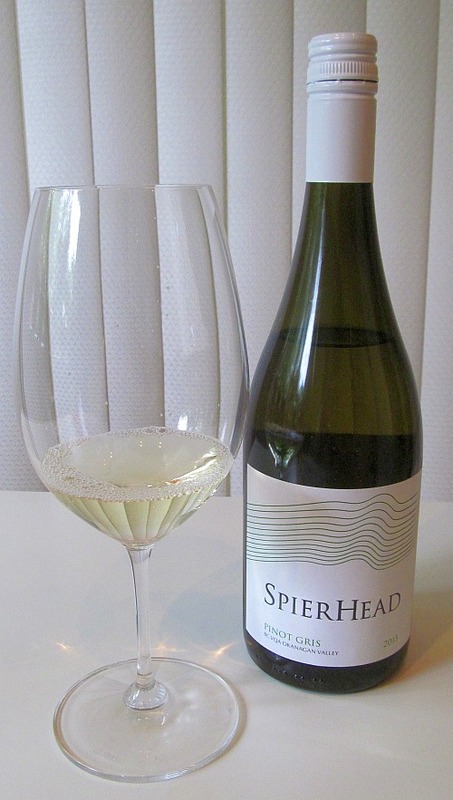 In case you are curious, here is the link to my review of Spierhead’s 2012 white wines. How has the Pinot Gris changed? Find out here. Enjoy!